I bought Duke in early January, 2010. When I went to try him he was a calm, unflappable horse who seemed to take everything in his stride. My mother and I brought him home and put him in a large paddock with lots of feed because he was a little skinny. 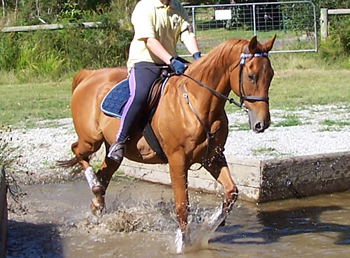 The first few times I rode him, he was just as good as when I looked at him but he soon deteriorated and every time I caught him, he would try to bite me. One time he even reared up and started lashing out at me with his front legs. It was like he thought I was a ghost. After that we decided to lock Duke up in a smaller paddock with not as much green grass and feed him more hay. He stopped biting me as much and was getting better to ride so I decided to take him to the local pony club camp. He only lasted two out of the three days before he started nipping again and his back got so sore that I could barely sit on him; he would just collapse in his back end. We took him home and got the chiropractor out the next week but by that time his back had magically gotten better and the chiropractor could not find anything wrong. After that, Duke was going really well for a while and was looking very good so I decided to take him to top teams dressage. When the day came, mum and I drove him down to Werribee (which for us takes two and a half to three hours) and got him settled down for the big competition. I started to tack him up so I could get on to warm up but I could not even touch his back let alone put a saddle on and ride him. Because I could not ride Duke and none of our team members had a horse that I could ride, we decided to start heading home. He went on the float fine but as soon as he was on he started freaking out, he was shaking and he was rocking the float. We had to take him out and stay the night in the pouring rain so he could calm down a bit. It was then that mum's friends told us about the Gotcha Feed Plan and how their horses had improved once they put them on it. We left Werribee early in the morning and when we got home mum rang and ordered some of the vitamins because there was no harm in trying it. Duke could not have gotten any worse than he was. It has been six months roughly since we received our first batch of vitamins and Duke's behaviour has been improving ever since then. 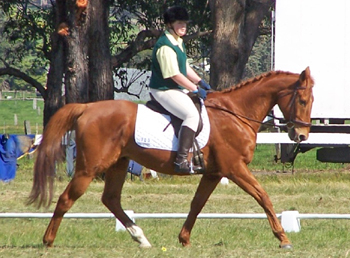 Something else that has also improved and in fact stopped completely is he was very stiff before in one hind leg, sometimes looking quite uneven, particularly in the canter. He would do a bunny like hop and in dressage tests I would get comments from the judge like 'appears uneven'. 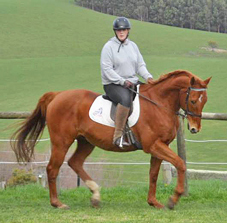 This has all but gone now and he can finally pick up a right canter lead plus track up properly in the walk and trot instead of stepping very short. Recently I took him back to the same camp as I had last year and all of the instructors told me that he had improved so much since the last time they had seen him. One of them thought I had even gotten a new horse he had changed so much. Darcy Nicoll (aged 16) - Fish Creek, Victoria.